So it came as a shock to many — including Susan Reverby, the researcher who made the discovery — to learn, more than six decades later, that U.S. health officials had conducted their own experiments on prisoners, mental patients and soldiers in the immediate wake of World War II, while the horrors of Nazism were still raw. Under the auspices of the National Institutes of Health, American doctors in Guatemala inoculated nearly 700 subjects with syphilis bacteria to see if penicillin might not just cure the disease, but prevent it in people who had recently been infected. Male subjects, even those confined to the penitentiary, were at first treated to visits from prostitutes known to have syphilis, Reverby found. If the subjects failed to become infected themselves, doctors poured a specially formulated inoculum onto abrasions they made on the men’s penises, or infected them via spinal taps. Women subjects, who were later added to the study, had the syphilis bacteria injected into the cervix. Subjects, Reverby said Thursday at Boalt Hall, were given a pack of cigarettes in payment for inoculations, blood draws or spinal taps. The reward for observation by medical personnel was a single cigarette. But this long-buried episode of U.S. history also raises troubling issues of medical ethics, informed consent and human rights, which is why Eric Stover, the head of the campus’s Human Rights Center, invited Reverby here to discuss the case after reading about it in a front-page New York Times story last October. Reverby’s paper about the two-year program, published in July 2010 in a “really obscure” academic journal, led to a formal apology from the Obama administration and a massive outpouring of worldwide media interest, from NBC and the BBC to Al Jazeera and, of course, the Guatemalan press. 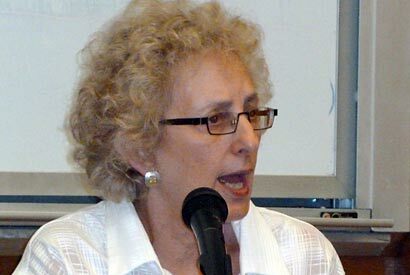 Reverby, a medical historian at Wellesley College, said she was researching another notorious case of unethical experimentation — the U.S. government-run Tuskegee study, in which doctors withheld treatment from black American men with syphilis — when she found references to the Guatemala study in papers donated to the University of Pittsburgh by John Cutler, a U.S. Public Health Service doctor who took part in the Tuskegee experiments. Reverby has written extensively about Tuskegee, notably in her 2009 book Examining Tuskegee: The Infamous Syphilis Study and its Legacy. Those experiments, which used Alabama sharecroppers as unwitting subjects, came to light in 1972, and President Clinton issued a belated public apology in 1997. This time, the apologies came from Hillary Clinton, the U.S. secretary of State, and Health and Human Services Secretary Kathleen Sibelius. Secretary Clinton also phoned Guatemala’s president, Álvaro Colom, ahead of the official announcement. Cutler — who was still defending the Tuskegee study as late as 1993, when he appeared in a Nova episode titled “Deadly Deception” — turned out to have been a key figure in the secret Guatemalan experiments as well. His papers, which he donated in 1990, garnered no notice until 2005, when Reverby found them in a university library. She said she was “blown away” by the discovery, but didn’t get to return to Pittsburgh to investigate further until 2009, when she was ready to move on from her Tuskegee research. In July 2010, she sent a pre-publication copy of her paper to a former director of the Centers for Disease Control, who shared it with current agency officials. Eventually, Reverby said, her findings made their way up the federal bureaucracy to the State Department and the White House. Then came the official apologies, and a barrage of interest and outrage that put Reverby at the center of a worldwide media storm. Horrific as Tuskegee was, it did not — contrary to widespread belief — involve actively infecting the subjects, Reverby stressed. The Guatemala study not only required intentionally (and often painfully) infecting its subjects, Reverby said, but involved deceiving Guatemalan prison and hospital officials as to the nature of the experiments. That point was picked up during a panel discussion in which Reverby was joined by Jodi Halpern, an associate professor of bioethics at the School of Public Health, and Arthur Reingold, a professor of epidemiology and the school’s associate dean for research.